Business—and especially information technology—is awash with acronyms and terms that can leave you scratching your head. What does that mean? Do we have one of those? Do we need one of those? If we do, how have we been getting by without it? If you hear any of these questions in your organization, you are not alone. So let’s see if we can help. CCM is the integrated set of solutions to design, deploy, deliver and manage interactions with customers across your business. CCM software systems provide a platform for the many types of correspondence and conversations that take place between the organization and the customer through many channels and devices. CCM software supports content types such as letters, invoices, correspondence, marketing materials, policies, statements and welcome kits. To make understanding easier, we have divided communications-use cases into structured, interactive and on-demand processes to help business-process pros get a better handle on application needs. Structured processes run in batches, often in large volumes. Structured output is scheduled, consistently formatted and sent as part of a service relationship much like billing reminders, Summary of Benefits and Coverage (SBC) and policy renewals. Interactive processes marry custom content or data with a preset structure. Interactive processes require the human touch, often matching variable customer data with structured templates, providing a more personalized communication. Examples include customer correspondence, approvals/denials and notifications. On-demand processes are triggered by events from the Web, fax, phone, email, transactional systems or enterprise applications. Your business faces multiple issues every day, ranging from simple replacement of copy paper to retaining valuable customers. While some issues are trivial, others are highly significant—they determine whether your business succeeds or fails. These are the critical business issues; the top priorities of your company’s agenda that need to be addressed quickly because they directly impact your success. 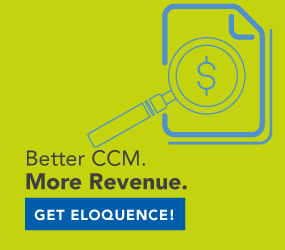 Most companies determine that they need a CCM solution after they have identified an overarching critical business issue: poor communications are impacting customer satisfaction ratings. A simple example might be claims correspondence. Your claims representatives may have to “cut and paste” information from multiple applications into a word processor just to generate a claim letter. If they make a mistake, your customers, who are already stressed because it is a claim (and the ones completing your customer satisfaction surveys), will let you know by calling your contact center confused or worse, upset. You’ve just increased your risk, your costs and your productivity, and have put your customer relationship in jeopardy. A customer communications management solution can help make this much easier and error-free.